Issue #9 of Ares was published sometime after May 1981, when issue #8 appeared. I am assuming it was in July, since the magazine is bimonthly and issue #10 is dated September of that year. 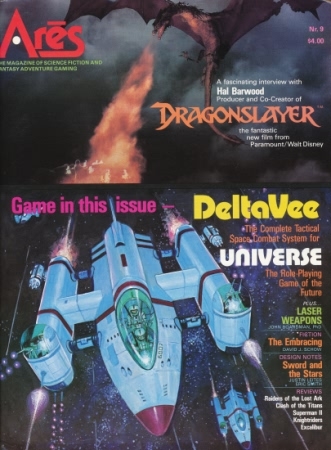 The lack of a publication date might be due to the unusual cover on this issue -- a "split screen" showing both a still from the movie Dragonslayer and the an illustration for DeltaVee, the issue's integral wargame. Issue #9 is also significant in that creative director Redmond Simonsen that "we've begun to include more game material in the issue," by which I presume he means less fiction and non-fictional background articles. Furthermore, as we'll see, DeltaVee is the biggest wargame included with an issue of Ares, therefore prompting additional changes. Michael E. Moore kicks off issue #9 with a lengthy interview with Hal Barwood, the producer of the 1981 fantasy film Dragonslayer. It's a fairly interesting article, though not exactly revelatory to anyone who saw the movie or has read about it. I didn't see Dragonslayer when it was first released, but I did see it a year later as the second part of a double feature with E.T. I've always had a certain fondness for it, perhaps because nearly everything about it is charmingly earnest without degenerating into camp, like so many other fantasy movies from that era. As part of the magazine's renewed focus on gaming, there's article consisting of playtester and designer notes for the science fiction wargame, The Sword and the Stars. At the same time, we also get another "science fact" article by John Boardman, called "Lasers in Space." Strangely, this one does not wholly poo-poo the idea that lasers could make viable weapons in certain contexts. This makes me wonder if perhaps Boardman was employed by the US Department of Defense to work on the Strategic Defense Initiative. Boardman's "Science for Science Fiction" returns, along with Susan Schwartz's "Facts for Fantasy." These articles remain as dry as ever. There is fiction in this issue, a short story by David J. Schow called "The Embracing" that I found utterly forgettable. Christopher John provides movie reviews for several noteworthy films of the era, starting with Raiders of the Lost Ark, which, like all good people, he loves. He is more critical, though still positive about Superman II, while he raves about Excalibur, a movie about which I've always been a lot more ambivalent. There are also reviews of Knightriders and Clash of the Titans, both of which are generally positive. David J. Schow reappears in an odd article entitled "Back in the Stocks," in which he laments the loss of bookstores with extensive back stock, making it harder and harder to find the classics of the past, "the past" in many cases being only a few years prior. Greg Costikyan reviews several books, most notably the first two volumes of Gene Wolfe's The Book of the New Sun tetralogy, while Eric Goldberg reviews games, including High Fantasy and Adventures in High Fantasy. Goldberg, once again, seems far less snarky in his reviews than in previous issues, which is to be commended in my opinion. We get brief -- a couple of paragraphs -- designer's notes for various SPI games, along with another installment of "DragonNotes," but the real attraction of issue #9 gaming-wise is DeltaVee. DeltaVee is not just a starship combat game for use with the Universe SF RPG, it's also the biggest game yet to appear in Ares -- so big that it was printed as a separate booklet rather than being inside the issue itself. Designed by John H. Butterfield and Redmond Simonsen, it's 16 pages long and very dense, far more dense than any of the starship combat systems with which I've regularly played. I have no doubt that its use of real world physics (hence its name) make for interesting gameplay, but nothing about it grabbed me enough to give it a whirl either now or back in the day, when I had a copy of the Universe boxed set that included it. Of course, I'd love to hear from gamers who did use DeltaVee, because I've always had the nagging sense that I gave up on it too easily. Ares continues to change with every issue I read, which is both a blessing and a curse. It's great because it means that I never know what to expect, but that's also why it's a curse. You can clearly see Simonsen and SPI shifting ground, looking for the proper mix of material to include that will satisfy their subscribers and the wider gaming public. It's fascinating to watch, especially through the distance of time, knowing as I do that Ares, like SPI itself, was destined not to survive much longer. Off-topic: James, what do you think about psionic in D&D? Many retroclons don't use it although Gygax write about it in D&D Supplement III. Some feeling about it? Christopher John provides movie reviews for several noteworthy films of the era, starting with Raiders of the Lost Ark, which, like all good people, he loves. He is more critical, though still positive about Superman II, while he raves about Excalibur, a movie about which I've always been a lot more ambivalent. There are also reviews of Knightriders and Clash of the Titans, both of which are generally positive. " It seems there were a lot more good movies back in those days. IMO, you didn't miss much by never playing Delta Vee. I'm a huge fan of the vector-based spaceship combat in Traveller and Mayday, but I find Delta Vee unplayable. The same goes for the somewhat similar tactical combat in Battlefleet Mars, and even the simpler situations in Starforce. GDW wisely stuck to two dimensions in its games. The third D added nothing except confusion and brain overload without enhancing the experience at all, at least not for me. Gygax always regretted psionics. Might be an interesting blog topic. I think you may be mistaking Delta V for another game. It was not a 3D vector system. It was a very simple and quite playable 2D system, somewhat similar to the one later used in Star Frontiers. This issue of Ares had special meaning for me. I saw it in Fandom II, the Ottawa game shop, along with Universe, and after buying the two games I ended up rebootingd my Traveller campaign. This in turn led to a long-running hybrid game with many good friendships, and several elements that directly inspired a lot of my later writing career. Delta-V's module-based approach would also later inspire my own starship design system which led to GURPS Spaceships. Despite its name Delta-V was not a realistic vector system, and was in fact very playable. Its movement system was real damn simple: your ship had a maneuver rating, like 7 or 9. If you moved faster than that you had to continue in a straight line. If you didn't you could turn a number of 30-degree hexsides equal to the difference between your speed and maneuver rating. Not hard. You also had an acceleration limit for your ship. The cool thing about Delta V was that ships were built on frames with modular pods which did different things. So you might have a ship with a limit of 5 pods. You had weapon pods, extra fuel pods, jump pods, cargo pods, fighter bay pods, Battle comm (ecm) pods, etc. Universe added more like exploration or bio-research pods, and so on. These were tied into the combat system so if you took damage your pods were damaged or destroyed. It also let you swap out (like the modern Littoral Combat Ship) pods for missions. Like choosing turrets in Traveller, but even more fun. The game also had a nice set of rules for missiles (which moved like simplified ships, with various types) and different types of beams (with firing options so you could burn more energy). Combat was neither too easy nor too little - ships were slowly ablated as pods lost armor, were damaged, or burned away, but it was relatively hard to injure PCs. Good stuff. So why wasn't it a classic? The movement system. It was simple and playable, but it was also *meaningless*. Facing had no effect on weapons fire in Delta-V and while relative velocity was accounted for in a simple rule, that affected both sides. Which meant that there was almost no reason to maneuver even in 2 dimensions! You might want to run from the enemy or a missile, but you could play that with a simple comparison of speeds or something. The whole edifice of movement, counters, etc. was really not much use, because the rules were built around maneuvers, and there was no reason to maneuver. In play, the result was that it was mostly just a waste of time. The Ares issue itself... I think the one thing I liked about SPI above all else was that they were serious about their SF, and they were living in the 70s or 80s rather than the 50s. I love some of the concepts Simonsen in particular came up with in the Star Force Trilogy - you could imagine, say, John Varley writing about a society dominated by ships full of thousands of cyber-linked female telepaths ("a cyborg named Lauren Silverwolf" was pretty cool) fighting mostly bloodless psi-wars in a background and 3D map with real stars, with aliens described as symbiotic machine-hive minds and so on. Funky seventies stuff. David; Looks like I need to eat some of my words. I'd have sworn DV was one of the 3-D spaceship games, but on double-checking, I see that I'd be wrong. You're right, I probably am thinking of Vector 3. I blame SPI for giving them names that rhyme. Although I ran some Universe, we only played Delta Vee a few times. It's pretty manageable...kind of a more complex, but still manageable predecessor to Classis Traveller's Mayday game/alt combat system for Traveller. Sword and the Stars, however, was a great game. It effectively took the system for SPI's Empires of the Middle Ages (a standard medieval strategy game that really focused more on empire and resource management than warfare), added some Sci-Fi chrome, and turned it into a sci-fi empire building game. This is where Ares really started to shine. I'm not James (and I am curious to see what he has to say about it), but I've always envisioned a D&D without psionics in the same way I envision an elephant without a trombone. I've never really felt like they went together. I've never run a fantasy game with psionics, as I've yet to see a good D&D system for running them (AD&D 1E's Psionics rules feel bolted on at best, and weren't balanced, 3E's Psionics rules might have actually been worse). I understand they're a big part of Dark Sun, but I've never run or played Dark Sun, either the 2E or 4E flavors. David, were the "fixed" rules you came up with the same ones published for GURPS? Or were they different? I'd like to learn more if you have them somewhere. Mayday came out in 1978, some time prior to this issue of Ares. _Vector-3_ was actually the much earlier true-physics version of _Delta-V_ (and the first to present what would become the standard SPI idea of pod-based ship design. As a game it lacked a certain something, especially as a tactical simulation, and as an addition to an RPG universe, it was pretty much a failure. The results tended to be inevitable (which was pretty much the point unless luck entered the equation on either side). However it did provide the philosophical basis behind the _Startrader_ combat system which bound everything nicely together (ships, pod, combat, interception, missiles, etc), albeit at a much more strategic level. More of a "did I survive that space battle I was in?" I actually preferred a modified _Shooting Stars_ (Yaquinto) for tactical space combat with vectors myself for one of my SF campaigns. With an added sense of doppler effects rules for lasers (move faster -> higher frequency laser emissions -> more damage). Right. I wasn't really asserting otherwise. Basically, DeltaVee was a better Mayday. Ah. "Predecessor" means "one who precedes another in time". If something is a predecessor to Mayday, then it came out before Mayday. Alternately, it could be used to mean "superseded by something", so that something that is a predecessor to Mayday is replaced by Mayday (which seems to be the opposite of what you meant). OK. You got me. I did use the word Predecessor. The truth is, I got mixed up there. :) Mayday did come out before DeltaVee. In fact, now that I think about it, I bought my first copy of Mayday a good year before DeltaVee. No worries. I was just offering a correction of a point of fact. It was not intended to be any kind of "gotcha" or criticism of you, personally. Then, I offered a correction of usage once your intention became clearer. Again, not a criticism of you personally. Jay, I no longer have the rule fixes. (They were written on paper and the tac display was a huge piece of cardboard; long since last 20-30 years ago). The tactical display was designed for single ship vs. ship combat and placed the PC's ship in the center of a "radar screen" type display, with range bands radiating out of it that various blips could be placed on, and that incoming missiles could close in from. The idea was to show it from the perspective of the ship crew - as a viewscreen display - rather than a board and give a "you are there" sense. There were a few tracks for things like power status but it did not have the "multiple console" display that would later later be used by FASA in Star Trek. Easy enough. I agree with you about the relative lack of playability of Battlefleet Mars system. Like Delta-V it also suffered from lacking much reason to maneuver, with ships all having global arcs of fire. The best playable use of 3D I ever saw in a board game was GODSFIRE from Metagaming, whose innovative (if unattractively monocolored) map design made 3D simple and playable.